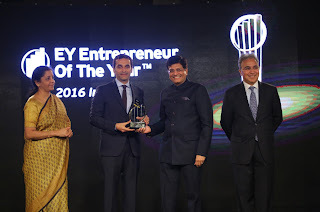 Mumbai, 27th February 2017: Mr. Vikas Oberoi, Chairman and Managing Director of Oberoi Realty, one of the leading real estate companies of India, was awarded the Entrepreneur of the Year (EOY) - Real Estate and Infrastructure Award at a glittering function in New Delhi. This award is a part of the highly prestigious global business award program by EY and was presented by Mr. PiyushGoyal, Minister of State with Independent Charge for Power, Coal, New and Renewable Energy and Mines and Ms. NirmalaSitharaman, Minister of State with Independent Charge, for Commerce & Industry. This award by EY for the Real Estate and Infrastructure segment, is an endorsement of Mr. Oberoi’s visionary entrepreneurship and commitment to build a better world. A Harvard Business School Alumnus, VikasOberoi, CMD, Oberoi Realty Ltd. is a disruptive strategist and a thought leader in the real estate industry. Under his leadership, Oberoi Realty has come to be known for its customer-centricity and its much-awarded luxurious real estate projects. With his vision of enhancing lifestyles, Mr. Oberoi’s business acumen transformed some of Mumbai’s least known addresses into much coveted locales and Oberoi Realty into one of the most trusted brands in the country today.